My drawings and collages are influenced by the Dada and Constructivism movements and reference various artists including Alexandre Rodchenko and Liubov Popova, Marcel Duchamp, Raoul Hausmann and Hanna Hoch. My assemblages are a bi-product of an intricate process of appropriating fragments until the compositions create their own statements. I collect publications of diverse subject from various nations and eras. A good part of the raw material comes from vintage books and magazines. The scraps are then re-assembled on paper, drawn over and retouched. They are accidents leading me in different directions. 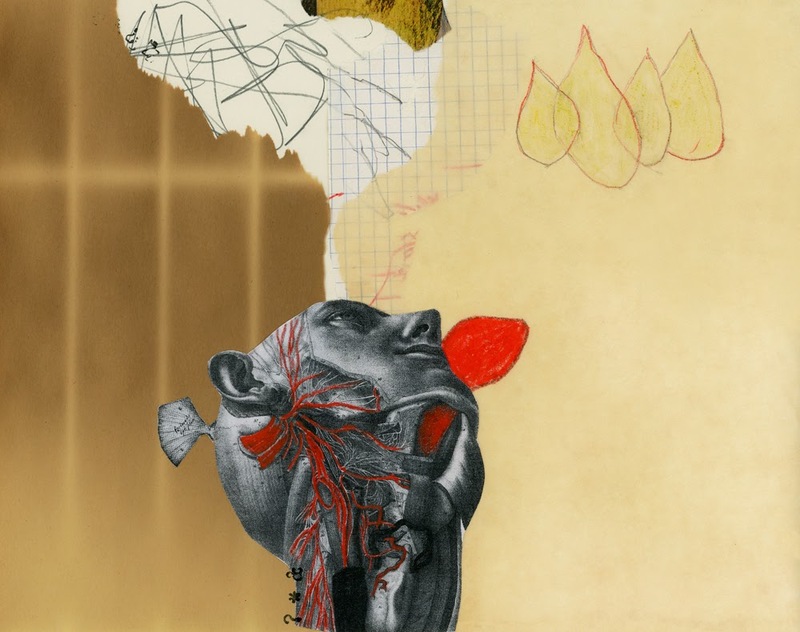 The drawings and collages are produced on paper on a small scale. Working in this scale is very different from working on a large scale, because I never try for a particular image and don’t make sketches in advance. Even the smallest pieces of paper might become a final piece of the assemblage. Along with objects and animals, there are human figures that are created as a kind of stencil: shadows. For the most part, faces have no eyes, bodies lack elaborate gestures generating an interior space: the more you leave out, the more intense the expression. They reflect an inner state. I find that the notion of the Absurd is one of the ways of facing up to a universe that has lost its meaning and purpose. It is not out of despair, or hope for another, but a demolition of the grandeur of this one. Doubt then begins to seem natural and inevitable. The intention for some of the work is to appear both funny and terrifying, to confuse and to clarify – to make sense of non-sense, to face the predicament of life and perceive with laughter its fundamental absurdity. Within this consciousness all we resume our acts and our life, fully aware of the world's absurdity, accepting the crushing responsibility of giving the world a meaning that comes solely from our own constructions. Marina Black grew up in Moscow, Russia. She originally studied History and Painting. Since moving to Canada, she has produced a body of work that includes photography, drawing and installation. Her work focuses on the subject of anguish, pain, mortality, abjectness and the fragility of the human species. Black has received grants from the Ontario Arts Council in 2010, 2011, 2014; IZOLYATSIA, a non-governmental Arts Foundation Fellowship [Ukraine] in 2011; W. Lawrence Heisey Graduate Award for outstanding achievement in scholarly and creative work in 2013. Her photographic work is included in the public collections of the Heritage Municipal Museum of Malaga, Spain; in Alliance Francaise in Toronto; in IZOLYATSIA non-governmental arts foundation [Donetsk, Ukraine. Her photographs have appeared in numerous fine art publications. Outside of her personal practice, Black has taught photography and drawing in several Canadian art institutions. She currently resides in Toronto.